Google has unveiled a new Living Stories are, where the New York Times and the Washington Post are experimenting with how coverage of a particular news story would look if content was all centralized within a single page. I don’t live in Washington DC, so schools there aren’t a big concern to me. My own local area has its own school problems. Nor do I care about the Redskins. Huge windstorms hit my area last night. There’s no news of that here. Clearly, this isn’t the place for me to start my day. The content will grow, of course, and it’s not fair to expect this as a replacement for the New York Times itself, or the Washington Post or Google News, for that matter. The focus of the experiment is on telling individual stories. Can this be done in a way that better takes advantage of the technology that the web offers. That page leads with a helpful summary at the top, followed by individual stories listed below. Interesting, but at first glance, it’s not something that stands out much from what you’d find at smart newspapers already. 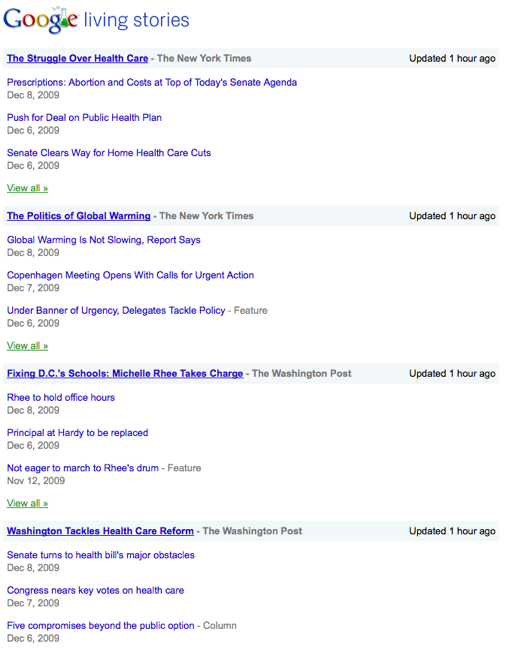 In fact, the New York Times already has a heath care “topic” page like this already. Still, this page is designed to have smarts. It supposed to recognize you, what you’ve seen and reflect only the crucial changes. The summary, for example, is written by editors. It will constantly be rewritten by them. If you return and there have been substantial changes, any of those changes will be highlighted, by comparing the last summary you’ve seen with the current one. As for the individual stories on the page, they’ll be shown with dark blue headlines when you first come, then they shift to light blue ones when you return, to indicate you’ve seen them before. Any new stories, those will be shown in dark blue. It’s kind of confusing, however. You may not have actually read the individual stories. The Living Stories page assumes you know what’s contained within them, but it makes that assumption even if you’ve not actually clicked to open some of them that will be closed. Open stories? Closed stories? Yes. By default, some of the individual stories will be opened up. These are ones considered more important by the editors, Google says. Some will show only a headline. Click on that, and you can read the story. This also leads to another point. That’s not the full story, nor can I even get to the full story from Google Living Stories. The full story is here, much longer, and there’s no link to it. What’s up with that? Google senior business product manager Josh Cohen told me that it’s up to the content partners on how much they want to show. In this case, the New York Times probably made the decision that the top portion of that story was enough — that the remaining part was all background that they figure is covered in other ways on the Living Stories page. He also confirmed that there’s no linking out from Living Stories pages to individual articles. That’s part of the experiment. Entire stories can be shown, if they wanted, but the idea is to integrate everything into a single URL. But what if you want to pass around a key article? There’s a “Share” link below them that will allow you to jump people directly to them on the Living Stories page. How is this filtering done? At the moment, editors at the two participating publications tag up their content so it can be filtered this way, Cohen said. Over time, automation might be used to do things like multimedia or quote extraction. “This is trying to cover an arc of a story, the legislative aspect of it,” Cohen said, of the New York Times’ page on health care. Story: Often used as synonymous with article, when talking about Living Stories, I’m using it to refer to a current news event that many individual articles might be written about. The debate on health care in the US Congress is a story. Topic: Sort of an umbrella term that might encompass many stories. 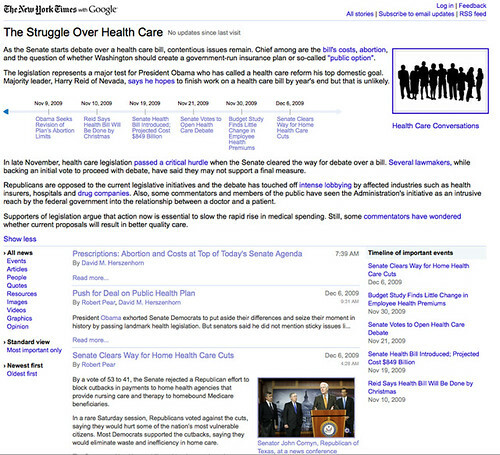 For example, there’s a general topic of health care in the United States. The current debate in the US Congress is one story in this topic. The debate held during the Clinton years is another story. The formation of Medicare is another story. Cohen sees Living Stories as working to cover stories in the definitions above, not topics. So all discussion of health care in the US isn’t covered. 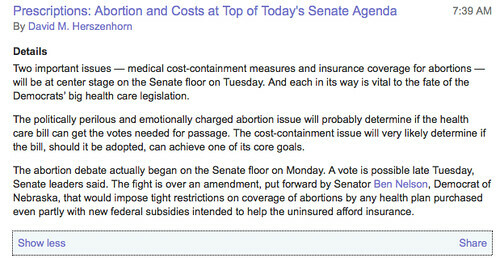 Instead, the progress of a health care bill is on story arc; there will be others covered on other pages. “The lifespan of living story would be longer than individual of articles that are part of it but shorter than a topic page,” Cohen said. When does that happen? How do you know when to create a new story arc page? That’s what the experiment is testing. “It’s something that I don’t think we have the answer to yet. We’ve tied to draw some distinctions here. We want to see how this works,” Cohen said. Want to keep up on a story? As mentioned, there are visual cues designed to highlight changes. You can also subscribe to updates via email or RSS. However, these aren’t so smart. They’re merely updates of when new stories are added to the page, which isn’t that much of a change than what you can currently get from many newspapers now. How about the inevitable ads question? There aren’t any now. Will they come? It’s an experiment. That’s what it’s about [now]. If over a longer time, if this is valuable to publishers, I would presume there would be ads on it,” Cohen said. Cohen also said that while only two publishers are part of the program now, that could also change over time. “The goal all along has been to make this broadly available not just to these two but to anyone. We want to see if it’s something that’s useful and if it is, we’ll decide what type of tool to make available to everyone,” Cohen said. By tool, that doesn’t just mean one that makes Living Stories that live on Google but instead that could be hosted on the publisher’s own web site. For now, those, hosting is on Google — and those stories are also not blocked from Google’s spiders, so it’s possible they’ll start ranking well for various topics in general web search (but not in news search, as Living Stories is not a source there, Google told me). That’ll open up other issues about whether Google is perhaps competing with news publishers through this experiment. Google also has a video below that explains the concept more. Check it out, especially to understand how the updating system works. Right now, that’s the hardest thing to illustrate. The system is so new that it doesn’t yet have more information to update me with! For related discussion, see Techmeme.